Wood is beautiful and a great building block for so many things, from homes to decks, furniture, and even toys. Left unfinished, its beautiful markings stand out, but when stained, finished and sealed, they’re even more evident. However, as strong as wood is, it is fibrous which means it wears down over time. That’s exactly why you need the best sealer to ensure that the project you’re working on maintains its integrity for a long time. Thankfully, there are some fantastic sealant options out there. 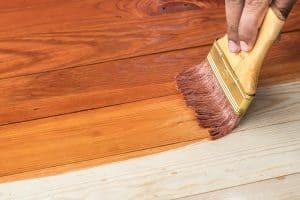 Below, I’ve reviewed top 10 wood sealers on the market to help you choose which one is right for you. Rust-Oleum is a brand known for its ability to preserve things, so it should come as no surprise that the brand’s sealant is one of the best on the market. It works with all clear wood finishes, plus, it’s also one of the cheapest sealants out there! One can of Bulls Eye Seal Coat treats 400-600 square feet. The shellac formula is wax-free and is incredibly fast-drying. You can paint on a coat of sealant, sand it down, and paint on another coat in just minutes! It really magnifies the beautiful look of the wood that you’re working with and over time it will not darken your project or yellow with age. This lightweight formula helps you get your projects done much more quickly than a wax-based product. Bulls Eye Seal Coat is great on every project, from refinishing your hardwood floors, staining a dresser, or finishing your cabinets. It is perfect for finishing wooden floors in high traffic areas, like your kitchens or living room. This product should only be used in the interior of your home. The original tricopolymer exterior wood sealant, this product’s reputation speaks for itself. This sealant provides a plastic-like coating, yet is non-toxic, eco-friendly and VOC (volatile organic compound) free. 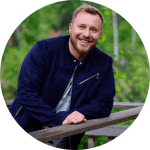 The product is incredibly easy to apply, and you could even have your children help you. There are no toxic fumes, and Lumber Seal is also pet-friendly. You can use it on your birdhouses, your dog houses and fencing for livestock. You can use this sealer outside, in fact, it claims to add years of life to wood siding, fence posts, and shingle siding. However, it would not be a good choice for a deck as the thick, glossy finish would be very slippery when wet. This sealer is so protective, it is the world’s first flood grade rated sealant, which says something. It’s often used to help with repairs to homes after hurricanes or floods. When applied to plywood in new construction, Lumber Seal evens out the drying rate of the wood, which can prevent warping. It works with most water-based stains and paints and would be a wonderful solution to use to seal your garden trellis, gazebo, Adirondack chair or fences. This indoor sealant has been providing a beautiful finish to wood since 1910, and the formula is so good, it hasn’t changed since then! Waterlox’s Original Sealer/Finish super-premium finish that is handmade from Tung oil. Tung oil is made from the nut of the Tung tree. As it dries, it hardens and gives the wood a rich, wet look. The formula dries and seals the surface, penetrating into its pores and waterproofing it. 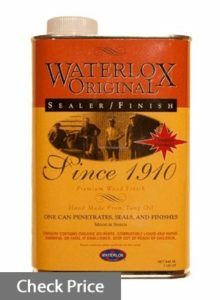 You can use 2-3 coats of this sealant to finish your project, or it can be used before using a satin or high gloss finisher; it is truly the most versatile product that Waterlox offers. It produces a medium-sheen with a 75-degree gloss level once it dries. That will fade a bit over time, to about a 55-degree gloss. This sealer provides great protection against water damage from all kinds of moisture. It also does not produce a slippery finish, so you can use it on your floors. It also is great for use on windows, doors, bar tops, tables and other furniture and other woodworking projects. One thing that makes this product unique is your ability to use it on other hard services like brick, limestone, linoleum or event cement to ensure that it doesn’t degrade over time. 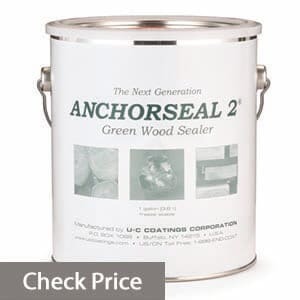 Anchorseal’s sealer has been used by professionals for decades. It is most widely known to protect wood against end grain checking. End grain checking is the term given to the splinters that you see at the end of wood planks that most often happens right after the wood is cut. Keep in mind that as long as your piece of wood has some kind of end grain on it you can use this sealer. I’ve been using this sealer on all of my green wood blanks for about a year now and I definitely like it. Anchorseal does reduce cracking by quite a bit: the sealer really cuts down on checking, it actually decreases cracking by 90%. The quality is really good and it’s totally worth it. To put it as simple as possible it is just a mixture of water and wax. As the sealer dries the water evaporates leaving a nice solid wax film over the end grain. It’s very simple to apply – just take the sealer and brush it to the end grain. This product is almost wax-like when dried, so it is not made for sealing all kinds of projects. For example, you’d apply it to the end of the wood on your newly constructed deck, but you wouldn’t use it to stain the entire thing. Also, be aware that this product should only be used to seal the ends of your wood project; it is not a stain and its waxy texture is not the right fit for areas that you’d walk on or frequently touch. It will also likely darken whatever wood that you apply it to, though it does dry clear. So Anchorseal is a great solution to protect your wood against end grain checking. I’ve never had any problems with it. If you’re looking for a rich, almost antique-like finish to your wood project, Rust-Oleum’s Amber Shellac is the perfect sealer for you. Unlike clear sealants, this will add an amber hue to the surface it is applied to; when you think of the traditional finish that you see in many homes on cabinets, floors, and furniture, this is the color that you’re thinking of. It’s great on projects, as the Shellac texture is smooth but not slippery. It is also important to note that this shellac should only be used on indoor wood projects; if used outdoors it will easily fade. This is an alcohol-based resin solution that is very easy to use: simply paint it on! It dries quickly (within 30-45 minutes) so it can be applied, dried, sanded and reapplied within an hour. If you mess up, or the color looks too dark, you can easily sand off the shellac and start over again. Plus, if you accidentally make a mess, the amber shellac is easily cleaned with ammonia and water. The shellac adds a beautiful depth and richness to the wood. It is not a high-gloss finish but does a great job of protecting your project from water damage and wear and tear. It is best used on indoor projects (even those that are high traffic!) like wood paneling and trim, a kitchen table and chairs or the railing on your stairway. Thompson’s WaterSeal Advanced is strictly for outdoor use and is one of the greatest products on the market to finish your pressure treated decks, outdoor furniture, shutters and fences! If you have a deck, you know that the upkeep can be frustrating. If you choose a low-grade finisher, you’ll likely have to sand, stain and finish your deck each year. However, WaterSeal’s maximum-strength formula will protect your deck for at least two years! Plus, there’s more good news-you need only apply one coat. This sealer can also renew the look of wood that has weathered over time or was not properly treated. With one coat, old, grey wood on your deck can look like you just had it installed. This sealant is the strongest ally that you can get to fight back against the rotting and decay caused by water and sun damage to the wood projects that you keep outside. The water-based formula is easy to apply and easy to clean; if you see a mess, just clean it with soap and water. It also resists mildew and protects against harmful UV rays while protecting the integrity and the natural beauty of the wood. Your satisfaction is guaranteed by Thompson’s, which is one of the most trusted, reputable brands for outdoor water sealing in the nation. 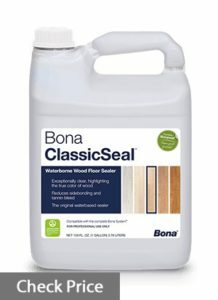 Bona’s ClassicSeal is a waterborne sealer that is intended for use on indoor hardwood floors. It highlights the beauty of your wood, protects it from water damage and wear and tear, and prevents any stain that was applied from bleeding. This is a semi-gloss formula that can be applied on its own or before applying another Bona product like BonaTraffic or BonaMega. You might only need one coat to finish the job, and experts recommend that you don’t paint the formula on but instead use a weighted rod or handheld applicator pad. You can do more layers if you feel like you need more protection, for example, in your kitchen, hallway or other high-traffic areas. Experts say that while you can use any brand on top of the ClassicSeal, there have been reports of incompatibility between ClassicSeal and some non-Bona stains. Originally, this product was called BonaSeal and was created to be a product to seal the wood before finishing it with another Bona product, which is why they recommend that you use another one of their products after. This sealer is non-toxic after it dries, goes on easily, has little to no order and dries quickly and clearly. It will not yellow or darken the stain or look of the surface that it is layered on. 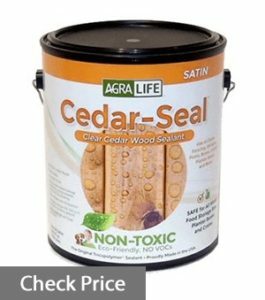 Agra Life’s CedarSeal is specially formulated to increase the lifetime of cedar and other woods with a higher oil content that are primarily used in projects kept outside. This sealant will not only waterproof wood but will enhance the beautiful pattern of its grain and maintain it for years of continued use. It will also keep the wood from cracking or splitting. It dries completely clear with a satin finish and can even restore cedar and other woods that have turned gray with age. However, keep in mind, that cedar naturally starts graying over time, so you will likely have to sand down and reapply in the future. CedarSeal does also increase the strength of the wood by allowing excess moisture to gradually evaporate out. The greatest part about this product is that it is a water-based formula that is completely non-toxic and eco-friendly. There are no dangerous ingredients, not toxic odors, no harmful chemicals here! It is so safe it can even be used as a sealant in food storage bins and in pet shelters. You might also use this product as a sealant for cedar shingles on your home, on a raised vegetable bed, fences, trellises, gazebos and pergolas, patios and more. If you’re not yet familiar, Ipe, like Tigerwood, Cumaru, and others, is what experts call an “exotic” hardwood. Ipe comes from a flowering tree that grows in Central and South America. 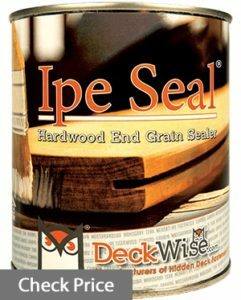 Ipe Seal is a wax emulsion sealer that is highly recommended by professionals to treat and finish Ipe wood. It is known to be one of the best protectants for the end cuts of decks. It also will prevent splintering and end checking in the ends of wood that has just been freshly cut. In fact, Ipe Seal is most effective when applied to wood within 24 hours of it being cut. To be completely clear, this seal should not be used on any surfaces that you walk on, it should only be used on end cuts and the face grain of carvings. Exotic hardwoods are especially prone to breaking and cracking at the ends as they dry out, and the damage happens quickly; usually within the first hours after it is cut. This sealer can be used on things like knives or knobs that are made of exotic types of woods or thermally treated one, though. It is paraffin based, not water based, so it looks cloudy when applied but dries clear. It creates a flexible protective coat that is waterproof. Keep in mind, this sealer can potentially darken the shade of your project, so it is best to test it out on a small area and let it sit for 48 hours before painting your whole thing. 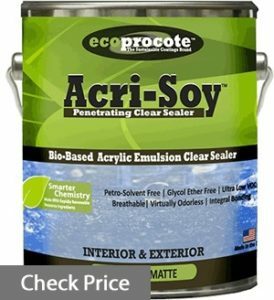 Unlike many other sealants, the EcoProCote Acri-Soy Sealer can be used both inside and out! That’s because it is all natural, non-toxic, is odorless and made 100% from plant oils instead of harsh chemicals. It’s also unique because it can be used to seal both wood and cement. The natural formula seals pores, strengthening the wood or cement, making it impenetrable to water. It also doesn’t disintegrate or flake off over time. The natural oil acts like a sap when applied to wood, restoring and strengthening it. When applied to cement, it blocks the buildup of a filmy layer of salt that breaks it down. When you eventually need to apply a new coat, you simply need to clean the area and apply Acri-Soy; no sanding or refinishing is needed! It is so easy to use. Acri-Soy dries quickly, within 30-60 minutes and since only a thin layer of product is needed, a little goes a long way. Wood sealant is painted on once your project is complete. Typically, it is applied after stain, but raw wood can be sealed for a more natural look. Sealant is used on wood (stained or unstained) to “seal” its pores and make it more solid. Sealing the pores prevents moisture from getting into the wood, which would eventually make it rot. When used on stained wood, sealant prevents the stain from bleeding. If you’ve been considering staining your project prior to sealing then you will find stains article helpful. Also, sealer can be used over the oiled wood. Oil requires some maintenance so you can use a sealer to escape the periodical reapplication of the oil. Furthermore, a sealer will give additional protection to the oiled surface. 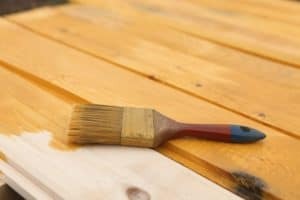 Check out oils for wood if you want to prevent your project from drying or give it a natural-looking shine. Regardless of what type of wood you’re using it on, sealant makes it smooth and can prevent scratches. It also lowers the risk of getting splinters, making your project much safer! 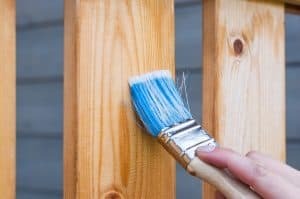 If you’re making something out of wood that will primarily stay outdoors, it is incredibly important that you seal it with a good sealant. It cannot be painted on top of wood that is dusty or dirty. Plus, if the wood is in the rain or sun, the sealant will break down over time, causing it to eventually warp or rot. A piece of raw wood by itself is strong and fibrous and durable enough to work for many projects but unfortunately deteriorates quickly over time, especially when kept outdoors or when used or touched frequently. The point of a sealant is to absorb into the pores, fill them and harden them so that they cannot fill up with water, and so that the hardened plastic makes the wood stronger than it even is in its natural state. This is most often done with a resin, wax, water or oil-based formula. Which works best for your project will depend on what environment it will live in and how it is applied. While this is far from an exhaustive list, it gives great options for every kind of project you might have. Before buying, think about the needs you have for your project because the sealant you buy needs to be specific to your situation. Do you need to seal wood and another surface? Do you want to buy one product to work on both? Will the wood be stored indoors or outdoors? Do you want to add color to your project? Do you need to protect it against mildew or UV rays, everyday spills or heavy traffic? What kind of finish do you prefer? Glossy, matte or silky? Do you expect to need to reapply it each year? Write down the needs you have and compare them to the list above. That will help you determine which sealant is appropriate for your project. With a large number of products out on the market these days, you can almost always find a solution that meets all your needs without having to buy multiple cans of sealant. 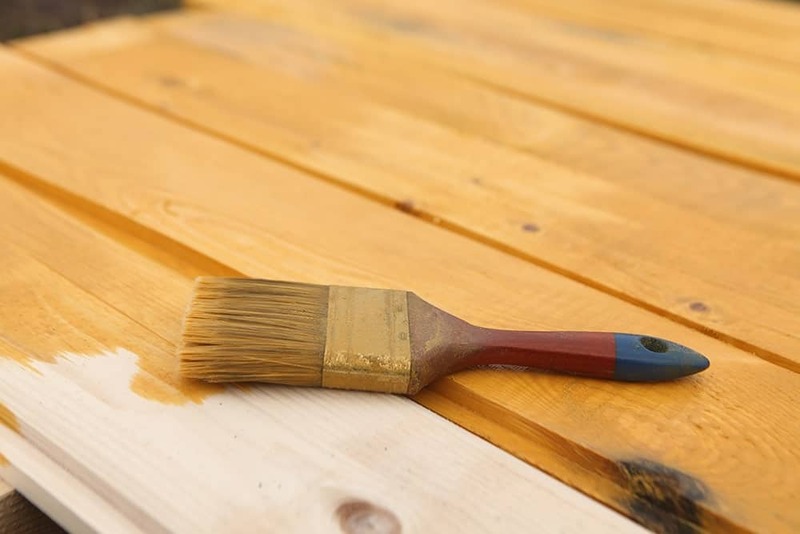 Whether you need a hard plastic coating or just a layer to keep out extra moisture, finishing your wood project with a sealant will ensure that it can be safely used and enjoyed for many years. It’s spring so I finally decided to finish my porch decks to make them last longer. I’ve studied many wood finishes to find out the best solution and I suppose stains and sealer are what I exactly need. But actually they have many similar properties and that’s confusing me. Which one do I really need? Hope you will glad to help me, thanks! Hi, Sonya, good to hear from you. Yes… newbies often walk into a trap of choosing between those two different kinds of finishes because they think they are the same. Yep, sealants and stain have something in common. For example waterproofing and rot protecting properties. But those are the only similarities. Stain is a pigment the main purpose of which is coloring the wood. Yes, it also protects wood from moisture, weather, and decay but stain does it worse than sealant. On the other hand, the main task of sealer is sealing the wood (who would have thought). Sealer does sealing much better than stain. Sealers are clear, they aren’t intended to change the color of the wood. So, if your main goal is to protect your project then sealer is great for you. Otherwise, choose wood stain https://woodimprove.com/best-wood-stains/. But as I said earlier stains don’t provide the best protection. Wait for stain to dry and apply a sealer so that you can make sure that your work is reliably protected. Κeep on writing, ցreat job! The first time I made a wooden chair in my garages from a Youtube video I had no idea that I needed to seal it. It got completely ruined within a week. Never going to make that mistake again. What is the point of sealing wood if it has to stay inside as Rust-Oleum requires? Isn’t the point to make it water resistant and able to be outdoors all the time? Hi, Harold. Yes, sealers are used for exterior wood most of the time. Interior sealers are intended for woods that are in constant contact with water: bathroom door, bathroom cabinets, wood next to the kitchen sink, etc. Also, they are very useful if you want to make the surface of your wooden project smoother. You can apply sealer before topcoat to prevent wood moisture from penetrating into topcoat. Or you can apply it over the finish to protect it. For example, you can seal stained wood to prevent it from bleeding. I love being able to do my wood projects in half the time, especially with Rust-Oleum sealant. I don’t use any other brand with my woodwork because every their paint just takes too much time. However, do you know if they make kinds like this for outdoor use? Hi, Tristen. I’ve seen nothing like that so far. For exterior I think it’s better to choose some different brand rather than Rust-Oleum. I have been trying to figure out what sealant to use on our new hardwood floor but my big thing was just the time it was going to take. Since we have two dogs we can’t keep them out of the house for too long. 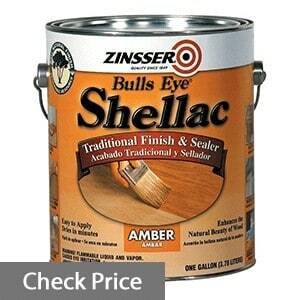 Would you recommend I use the Zinsser Bulls Eye Seal Coat because it dries faster? Is it actually a good sealant? Glad you asked me, Jami. For floors I would recommend Bona ClassicSeal. It’s designed just for floors, Bona is more durable option in comparison with other sealers on the list since it has to deal with high traffic. So Bona is the best for you even though it dries 2-3 hours which 2-3 times longer than other sealants do. So we recently redid the flooring in our basement and the company actually used the Agra-Life sealant and now we can’t even walk downstairs. It’s just way too slippery. Now we have to pay to get them redone and I don’t want to make that mistake again. I will definitely be asking the next company what they are going to use on the floor first. Hi, Kelly. Yep, Agra-Life isn’t the best option for sealing floors. Bona would’ve been much more suitable for you as I mentioned earlier. Try to use it the next time, it will be perfect the result. Hi, Oliver. I used Agra-Life for exterior pieces and they still look great. I suppose you applied too thin coat which is a common problem of this sealer. Although I didn’t use it for floors and deck since it’s slippery. Use Thompsons Waterseal instead, it’s great for outdoor pressure treated wood. Does the Agra-Life sealant really protect again sun? Does that mean fading in color or actually keeping the surface from getting super hot? 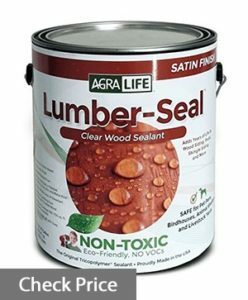 Agra-Life like all wood sealers protects wood against the sun beams which means it prevents wood from fading. Temperature is out of context here. I really just don’t see how anyone can justify the price of Waterlox Original Sealer over other sealants. Does it really do that much of a better job? Hi, Jensen. Actually it’s because Waterlox comes only in gallon size which means it’s price by default 3-4 times higher since most of the other options are 1 quart volume. If you don’t need so much sealer you don’t have to overpay. I use the Waterlox Original Finish for all of the wooden toys that I make for my Etsy shop. It works so well and dries so great. I’ve never had a problem with it. You can never go wrong with a product that has been on the market for as long as Waterlox. I feel like it’s so simple and yet works so well. No crazy selling gimmicks just good products. I love how you can kind of manipulate the color of your sealant with the Rust-Oleum brand. I’ve accidentally changed the color too much on my floor and all I had to do was sand a bit of it up and the color went back to what I wanted. Hi there, Samuel. This is true not only for Rust-Oleum, you can do the same trick with most of the sealers on the market. A bunch of my wood making friends says they really don’t recommend the shellac Rustoleum because it can get really uneven. I really want that thick look though and I haven’t found anything that matches the look I’m going for except this stuff. How do you recommend I apply it? It’s pretty simple. Apply it using a fine bristle brush and for it to dry. Now, if the coating is uneven you simply have to sand it until you get desired level. What is the cheapest sealant you have on this list? I just need to seal up a project I have recently done. Doesn’t need to be nice or pretty just water resistant. Hi, Jeff. I suppose it’s Rust-Oleum Shellac or Rust-Oleum Sealcoat. I used the Rust-Oleum shellac for my cabinets and they look absolutely amazing. I’d definitely say go with this one if you’re on the fence between two. Easy to apply and doesn’t take long to get done. 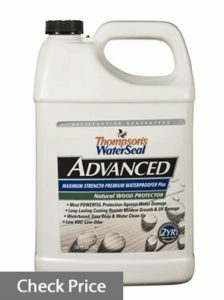 Why is Thompson’s WaterSeal only to be used outdoors? Is it toxic or something? Why would I want that on my deck if it’s toxic anyways? Exterior finishes have to deal with harm conditions. That can be achieved using strong chemicals. It doesn’t mean that exterior sealers are toxic, but they are preffered to stay outdoors so that their chemicals don’t harm you in any way even if their impact is minimal. Where would you suggest I get more info about how to actually use sealant on wood? I made a cabinet that I need to seal but I’ve never actually done it before. If a con of the sealant is that it will yellow the wood then why is it even on the list? There are plenty of sealants out there just like Thompson’s WaterSeal that don’t have that risk associated with use. Actually, Tompsons is the best sealer for exterior decks, furthermore it’s the only option designed especially for that purpose. Yes, some customers reported yellowing (I didn’t seen that though). Even if it yellows a little bit for some kind of wood it’s not a big problem for pressure treated decks. Bona is really only meant to be used with other Bona products. They just want you to buy more of their products. I did my kitchen floors with Bona a few years ago and they still look fantastic! Doesn’t appear to have any wear even though we have many people walking in and out every day multiple times. I feel like more companies need to take a hint from Agra Life. They’re out here working to save the planet while also having really great looking floors.